Traveling across borders between Costa Rica and Nicaragua or vice versa is relatively easy and cheap when you know what to do. That's why we created this guide to make sure your border crossing will be as smooth as possible. You have two options on how to do the border crossing. You can either take an international bus heading from San Jose, Costa Rica to Managua, Nicaragua or you can do it on own. International Bus | Traveling on an international bus across borders is certainly the easiest but also the more expensive way how to get from one country to another. Several companies such as Tica Bus, Nica Bus or Transnica run their services on this route, and you only need to buy a bus ticket in advance. The bus will take you to the borders, wait for you and drop you off at your final destination. This is certainly a way to go if you are in a hurry or when you are willing to pay a bit more. Traveling by car | Although traveling by rental car is a popular option in Costa Rica and a way how to explore this Central American country, you actually cannot cross the border between those two countries with rental car. Crossing Borders on Own | Traveling from Costa Rica to Nicaragua on own is what we did, it requires catching a bus to borders on Costa Rican side, walking through immigration offices and catching a bus from Penas Blancas to Rivas and it is much easier than it sounds. When you arrive late in Liberia, it is better to spend a night here before crossing the borders to enhance your safety. Budget | Hostel El Buey Azul - The cheapest option in the city with private rooms, and a great position in the center. Mid-range | Backpackers Liberia - Spacious clean hostel has a fully-equipped kitchen, both private rooms and dormitories, and friendly hosts. Luxury | Best Western El Sitio Hotel & Casino - The best thing about staying in Liberia is that normally luxurious hotels are reasonably priced no matter you are still in an expensive country, Costa Rica, so you better take advantage of it. 1. | First thing what you need to do is to get to Penas Blancas, the border. It depends on what is your destination before heading to Nicaragua, but you need to get either to La Cruz or to Liberia from where regular shuttles go to the borders. We were heading to borders from Bijagua, a small village which serves as a base for visiting beautifully blue Celeste River, so from there we took a bus to Liberia. There are two bus stations in Liberia only three minutes walk from each other, so do not panic when you end up in the wrong one. The bus from Liberia to Penas Blancas cost 1760 colones per person and takes about an hour. You can also change Costa Rican colones to Nicaraguan cordobas here at bus terminal in Liberia or at the borders for the acceptable exchange rate. 2. | Once the bus drops you off, someone will approach you and direct you to a small office on your right as you need to pay an exit tax. If not, look for the office on your own otherwise you will have to get back later. The exit tax from Costa Rica is $8 per person - it is better to have US dollars, but you should be able to pay it in colones as well. An interesting fact - after we got the receipt, there was written that we paid only $7 and out of $7 we apparently paid $2 for a non-existence luggage check. 3. | Once you paid the fee, continue and enter the immigration office on your left and wait in the line in order to get a stamp into your passport. An officer in our line was incredibly slow, but after 30 minutes we could carry on. 4. | Now you need to walk from Costa Rican side to the Nicaraguan side of the borders. There are many tricycle drivers who will keep telling you that it is too far and you cannot walk on your own, but if you do not mind to walk 5 minutes on a flat road, you do not need to use this service. 5. | While walking, we were stopped by two different people in uniforms checking again our passports. 6. 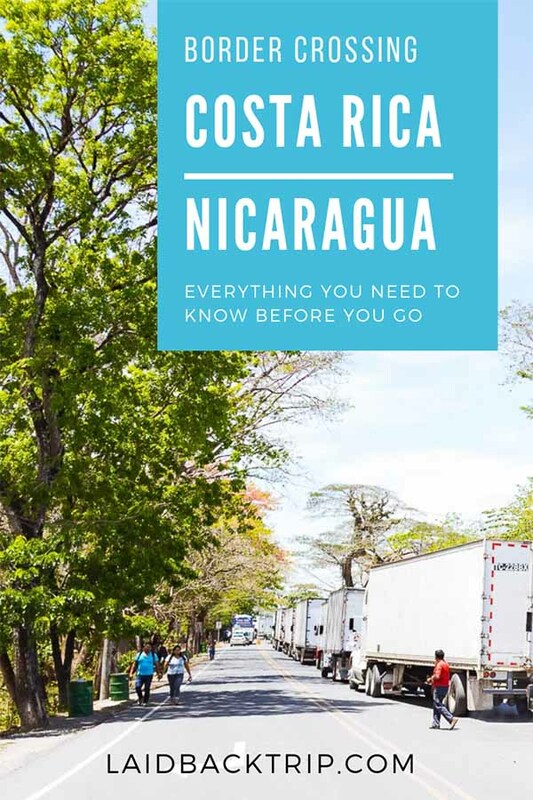 | Once you get to the Nicaraguan immigration office, first you have to go to a window on your right where you will pay $1 municipal fee, and then you need to line up in a queue to get a stamp allowing you to stay in Nicaragua. To enter Nicaragua, you also must pay $12 per person to an immigration officer. The process was pretty slow as he must fill out like a hundred forms and stamp and sign each one. We don't need a visa to enter Nicaragua (check requirements for your country), and we even did not have to show proof of onward travels although we purchased one the day before. The officer only wanted to know the name of a hotel in our first destination in Nicaragua and asked us a few questions about our occupation, and found pretty funny we don't have one. 7. | After we exited the immigration, we were officially in Nicaragua, and the next task was to get to our first destination in Nicaragua, San Juan del Sur. Generally, there are plentiful buses heading to the capital Managua or to Rivas, Nicaraguan transportation hub where every traveler will end up at least once while in the country. Again, there are many taxi drivers, and you can choose whether you want to wait for the bus or if you want to drive straightaway (rides with a cab are cheap in Nicaragua, so it is a convenient way of transport). The only thing we really did not like were constantly lying taxi drivers in Nicaragua - they are able to tell you ten times that there is no bus going to your destination even when you are almost sitting in one. Just be patient, and be prepared to answer 'no gracias' thousand times. When you are heading to Rivas, take one of the frequent chicken buses leaving every 30 minutes, they cost $1 (30 cordobas). If you plan on getting to San Juan del Sur, you don't need to go to Rivas first and take a bus to the beach town after, but ask the driver to drop you off at intersection known as La Virgen - buses to San Juan del Sur pass here every 30 minutes and you save some time and money. If you’re planning on visiting Ometepe Island, where you can hike the 1610 meters high Concepcion Volcano, you need to change the bus in Rivas to San Jorge, from there take a ferry to the island. Taxi from the borders to San Juan del Sur cost $25. San Juan del Sur is a pretty beach town, and for many, including us, it is the first destination on Nicaragua travel itinerary. Here are some tips on where to stay. Budget | Selina Maderas - An atypic hotel close to Maderas beach offers accommodation in teepees or in standard private rooms. Mid-range | Hush Maderas - Amazing well-priced accommodation with an infinity pool overlooking the beach. Luxury | Hacienda & Ecolodge Morgan's Rock - An exceptional concept of bungalows offer the luxury in the jungle.